GLENDALE, Ariz. -- With two iPhones in his pants' pockets, a Bluetooth receiver dangling into his blue polo shirt and a tiny headset in his right ear, Paul Rovey stands on an island of agriculture just a few miles from the desert city of Phoenix, Arizona. The chairman of both the farmer-funded Dairy Management Inc. and the U.S. Dairy Export Council is a maestro with manure on his boots, toggling calls between his wife, four children working on the farm, 50 farm employees, United Dairymen of Arizona, DMI, USDEC and the local neighbors his farm serves. To keep up, Rovey, 60, is considering adding a third iPhone, but he's running out of pockets. 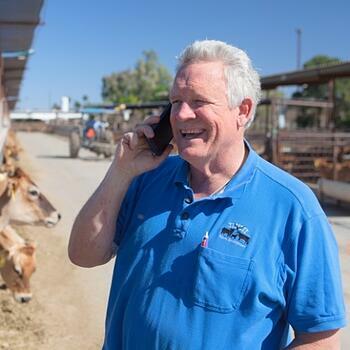 Just don't tell Rovey running a large farm, chairing two national dairy organizations and presiding as president of an Arizona co-op is a lot of work for one man to do. "This isn't work," he says. "It's fun." 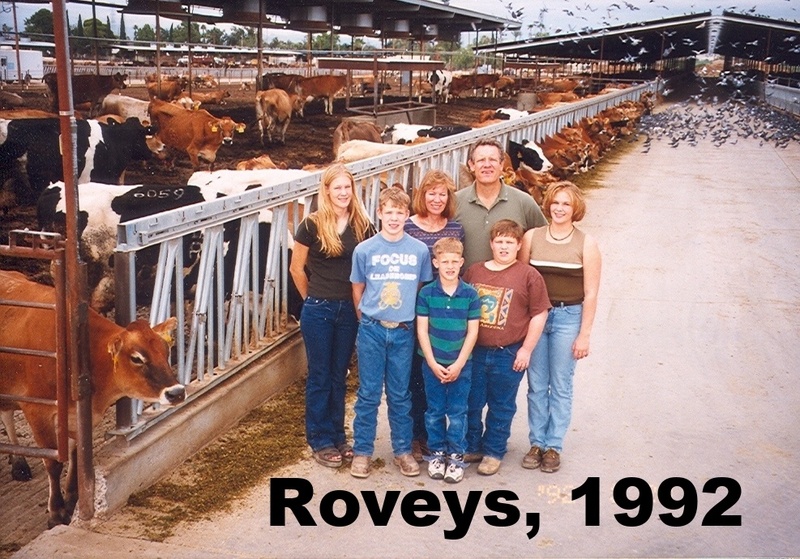 While Rovey's base is an 1,800-acre, 2,000-cow farm his grandfather started and his father passed down to him, he is keenly aware of the importance of global dairy markets. Today, the milk from one out of seven dairy tankers leaving American farms is turned into products and ingredients sold overseas. Rovey delights in the fact that his co-op, United Dairymen of Arizona, turns milk from his farm into milk powder providing proten for children in Vietnam. From his day-to-day farming, international travels and access to dairy leaders in the United States and abroad, Rovey has an informed and unabashedly bullish perspective on the future of U.S. dairy exports. Even during a year in which global markets have weakened, milk prices have taken a hit here and abroad, and Rovey has been on crutches due to ankle surgery, he remains as upbeat as ever about the U.S. dairy industry and the future of exports. "Paul Rovey is an incredible ambassador," says Margaret Speich, who has accompanied Rovey on three U.S. dairy trade missions as USDEC's senior vice president, strategic and industry communications. While Rovey's role as USDEC chairman has taken him around the world, his first priority is his family and his farm. From there, one can easily see University of Phoenix Stadium, the site of Super Bowl XLIX, appearing like a glimmery, silver monument somehow rising from the soil of Rovey's own farm, just a few miles southwest. The three-minute video, below, tells Rovey's story concisely.The Q&A that follows goes into more depth on a variety of topics. This video, featuring Rovey, was shown at the U.S. Dairy Business Conference in Singapore in April. Q: Can you share some essential facts about this farm? PR: We farm about 1,800 aces and milk just shy of 2,000 cows. We milk Jerseys. We grow most of the feed that goes to our cows. We grow all of our corn silage, all of our alfalfa hay, our sorghum silage, rye grasses, sugar beets, and some of the barley. We bring in fresh feed off of the fields to feed to the cattle. It’s fresh, nutritious, smells good and they really like to consume it. We have about 50 employees on the dairy and the farm. Four of my children help me. My daughter works in the office and the three sons work on different aspects. One takes care of the farming operation, one takes care of the cattle and the other son goes between all the other operations. So it’s truly a family event here. It’s really not work. I’ve got to repeat that. It’s not work. It’s a fun thing to engage in farming, to meet the challenges to produce great products. That’s very rewarding to me and to all of my family members. Q: How did this family dairy operation start? 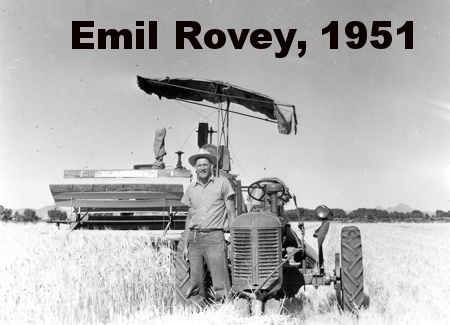 PR: My grandfather, Albert Rovey, came to Arizona to farm in 1912 on ground that is now sitting in downtown Phoenix. When my father, Emil Rovey, graduated from the University of Arizona he looked for ground in another area. He bought the land where we are today in 1943 and started with 120 acres of ground before acquiring more. I came along in 1955 and I grew up helping on the farm, milking cows, doing all the things that kids should do on a dairy living in a rural area. As we’ve developed over the years the town has actually moved in around us and now I’m an island of a dairy and farm in the middle of a city. We have worked very hard to be good neighbors, minimizing any of the odors or other negative aspects of the dairy operation. We also provide good nutrient manure for the neighbors’ gardens. We work symbiotically with the neighborhood. We milk about 2,000 cows between this farm and two other and two other locations on a total of about 1,800 acres. Q: What was it like growing up on a dairy farm and when did you realize you wanted to be a dairy farmer yourself? PR: Growing up on the farm was just completely natural to me because I enjoyed going out and doing things with my father. I started driving tractors when I was six years old because it was a case of my dad needing a tractor driver and I was available. There was no one moment of decision. It was just a case of this is what you are born to do, this is what you are doing and you are going to love it. Being on the farm isn’t work. It’s actually a tremendous amount of fun and it is challenging. Every day is different. Every day is new. We never get bored because of the weather and other circumstances you face. Every day is always just a little different. So it gives you a challenge of being able to address things in a real positive way to make a tremendously nutritious product for the nation as well as the whole world. This video, from the Ponderovy Dairy website, expains the farm and its history. Q: Would your grandfather and father have been surprised dairy exports would grow in importance like this? PR: When my grandfather was farming he wouldn’t have dreamed of being able to export anything out of the country. But as time transitioned my father was very progressive, and that had an influence on me. His attitude was you need to be proactively participating in the community, looking and seeing where your opportunities are. Exporting was in its infancy but he was thinking about it. When he retired he did a tremendous amount of travel around the world, which gave him a big world picture. Some of that rubbed off on me. That’s why I think it is a great opportunity for us as U.S. dairy farmers to not only produce for our domestic market but also to be able to provide great dairy nutrition for the rest of the world. 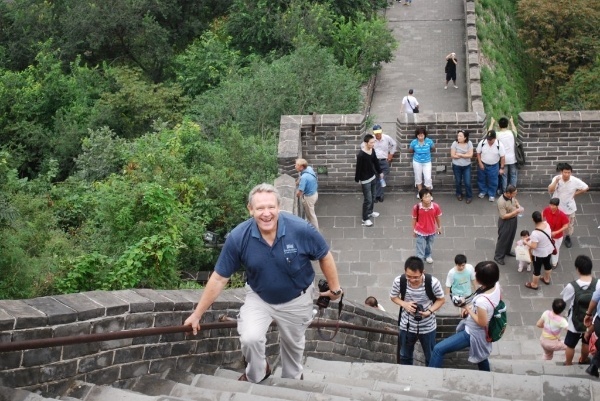 USDEC Chairman Paul Rovey bounds the Great Wall of China during a 2008 USDEC trade mission. Q: You have met with dairy importers in China and other countries.What is the best argument you can make to them to buy their dairy products from the United States instead of one our competitors? PR: Unlike some of our global competitors who have seasonal production, we have 365 days a year of supply and we have a large, geographically diverse, country. So if there is a drought in one area, the other areas can pick up the slack and increase that production. That’s why I see the United States as being the greatest dependable country for producing milk needed around the world. That’s why I see the United States eventually becoming the leader in the world supply of dairy products. Q: Customers overseas are sometimes surprised to learn 99% of American dairy farms are family-owned and operated. Address the myth, if you would, that Corporate America dominates the U.S. dairy industry. PR: Our dairies have grown larger over the years. We are seeing less and less dairies that are milking tremendously more cows. But the heart of the matter is that these farms are nearly all family-owned and family-run. People from the family are involved in these farms and own the farms. Somebody from the family, part of the ownership, has to be there on a day-to-day basis to make things things work and to be successful at it. My kids are going to take over this dairy when I step out of the way and and they’ll continue that tradition with their children, just as I did with my dad and my dad did with his dad. Q: Why is there a false but lingering perception that exports are an afterthought for the U.S. dairy industry? PR: It’s true that as a country we have historically had huge domestic consumption and at one time the thinking was that if we had anything extra we would dump it on the world market. Now those ideas have completely changed. In fact, we are investing in our plants and in our production facilities so that we can supply our global customers exactly what they need on a 24/7, 365-days-per-year basis. The whole mindset has changed because we now realize that there is a tremendous opportunity for us as businesses as well as a tremendous obligation to provide these products to the world. We can do it. We have an abundant supply, we have the production capacity and an increasing commitment to making the products that they want. Q: As you milk your cows on this farm, do you sometimes think about some of your end users thousands of miles away? PR: Absolutely. Our co-op, United Dairymen of Arizona, exports a large amount of our production out of Arizona and much of that goes out to the world. We have exported to 47 different countries and that makes you cognizant of the fact that those consumers are out there and they need this product. For example, my milk on this farm has a very good chance of being served to somebody in Vietnam because United Dairymen of Arizona sells quite a bit of milk and milk powders into Vietnam. It’s gratifying to know that my on this farm can be sitting in some sort of product in Vietnam, consumed by a Vietnamese customer who is getting that great nutrition.